Paddock Street runs east-west between McHenry Avenue and South Williams Street. The street cuts right through the land which was once the farm of Richard Paddock and family. Richard Paddock was born February 23, 1808 in Onondaga County, New York. His father, James Paddock, served as a militiaman during the War of 1812. James was a miller by trade, operating a large saw and grist mill in New York. In 1833, Richard Paddock married Nancy Betts in New York. Shortly thereafter, two generations of Paddocks moved west to Illinois. The Paddock families first settled in Palos Township, Cook County, Illinois. The Palos Historical Society cites James Paddock as the first white man to settle in Palos. 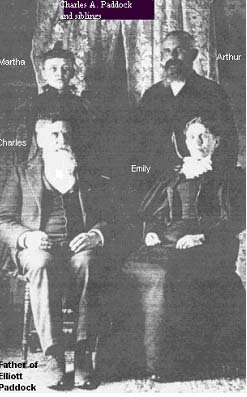 In 1845, Richard, his wife Nancy, and their children moved to a farm on the north edge of Algonquin Township in McHenry County. The village of Crystal Lake was situated less than a mile southwest of the farm. At that time, the railroads did not run through McHenry County, and the village of Nunda did not exist. Richard and Nancy Paddock had nine children: Charles, Chauncey, Sarah, Arthur, Emily, Daniel, Sylvester, Richard, and Martha. Their son, Sylvester, was a member of Co. F, 95th Regiment of Illinois Volunteers during the Civil War. He died in a Memphis hospital, from Typhoid Fever, at the age of 16. After the death of his wife, Richard Paddock began to subdivide his large farm and sell the lots. The May, 4, 1883 Nunda Herald has the following announcement: “Mr. Paddock’s lots will soon be all sold. No use buying if you don’t intend to build—speculators’ lots don’t improve a town.” In 1883, the Union School was built on several lots that were formerly part of the large Paddock farm. By 1887, Richard Paddock must have sold his last lot, as he moved to Minneapolis, Minnesota to be near one of his children. Richard Paddock died April 15, 1895. His body was brought back from Minnesota and laid to rest at the Crystal Lake (Lake Avenue) Cemetery. Richard is buried near his wife, Nancy, son Chauncey, and daughter Sarah.